Years ago hostels were mostly big dormitory rooms where people shared a bathroom, kitchen and a common room. There were not so many hostels who offered also private rooms … well, not for a reasonable and affordable price for young tourists at least. 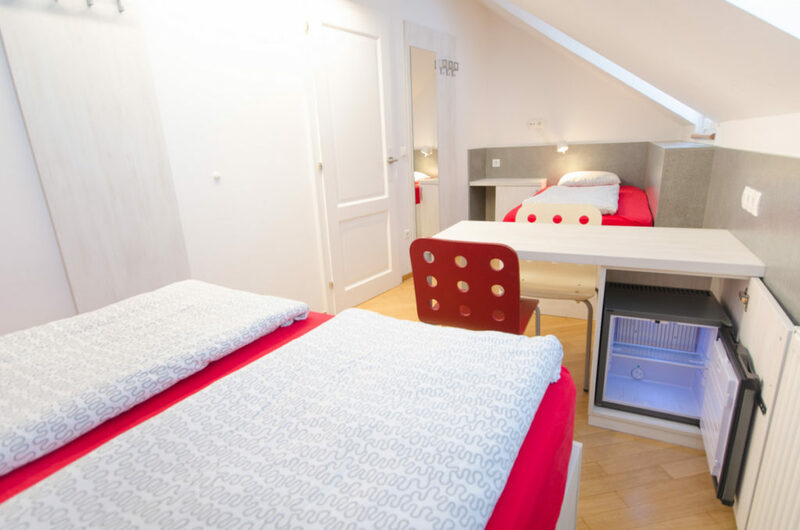 Nowadays most of the hostels offer also private rooms with a shared or even private bathroom. Also H2O Hostel is one of them. Our hostel is “divided” into two parts. On the ground floor you can find the reception (with a small shared kitchen and a common room) and dormitory rooms. On the first floor we have three double and one triple room with a shared bathroom. We can also accommodate you in a private double room with a private bathroom, these are located in our other building couple of meters down the street. All of the rooms have also a fridge and a TV, but we hope you won’t need one (wink wink) :P.
Of course that doesn’t mean that couples can not stay in our dormitory rooms, but if you want you can also find some privacy in other rooms :)! This fact was also noticed in THIS ARTICLE. Thank you! If you want to reserve your room, you can do that HERE, you can also send us an email or call us. If you prefer some online booking engine, that is not a problem – we are also present on Booking.com and Hostelworld. The choice is yours. This entry was posted in About H2O Hostel Ljubljana, H2ostel Blog. Bookmark the permalink.